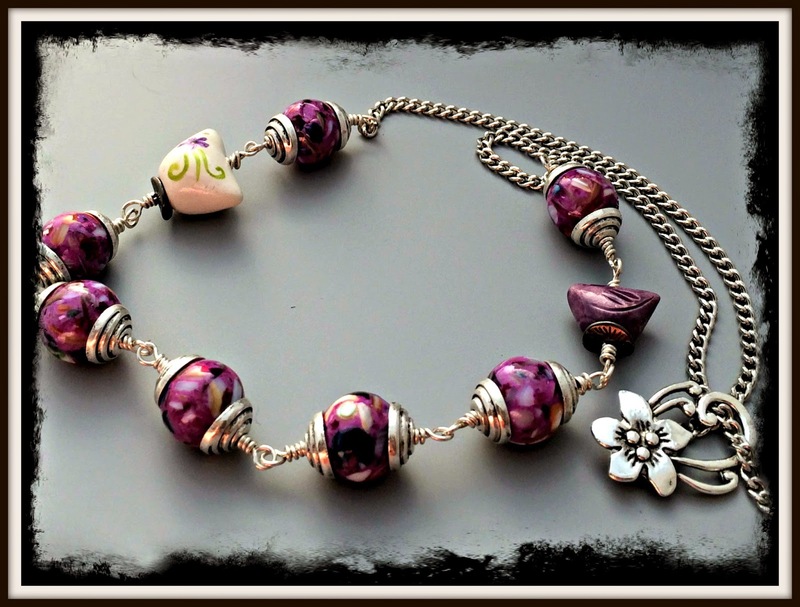 Back in February (yeah back when I thought that winter would never end), I saw a blog post from Caroline Dewison of Blueberrie Beads. She was as tired of winter as I was and decided to join with some friends to do something about it. Caroline joined with a couple of her friends, Leslie Watt of Thea Elements and Claire Braunbarth of Smitten Beads, and decided to host a blog hop. With spring in mind, they put together some packs with some gorgeous sari silk and ceramic beads. Now I admit that I was so excited to start playing with the goodies I recieved that I forgot to take a picture. So instead I am going to borrow couple pictures from Caroline's blog to show you some of the packs. To see them in all their glory, head over to this post. I have always admired those designers that use sari silk so effortlessly, and I have even picked up some to work with. But it has always intimidated me so my silk has just hung there unused and I am sure feeling unloved. With this challenge, I didn't have a choice but to conquer that fear and plunge ahead. I has picked up a heavy brass bangle from a clearance sale because I thought that I would be able to use it for something. 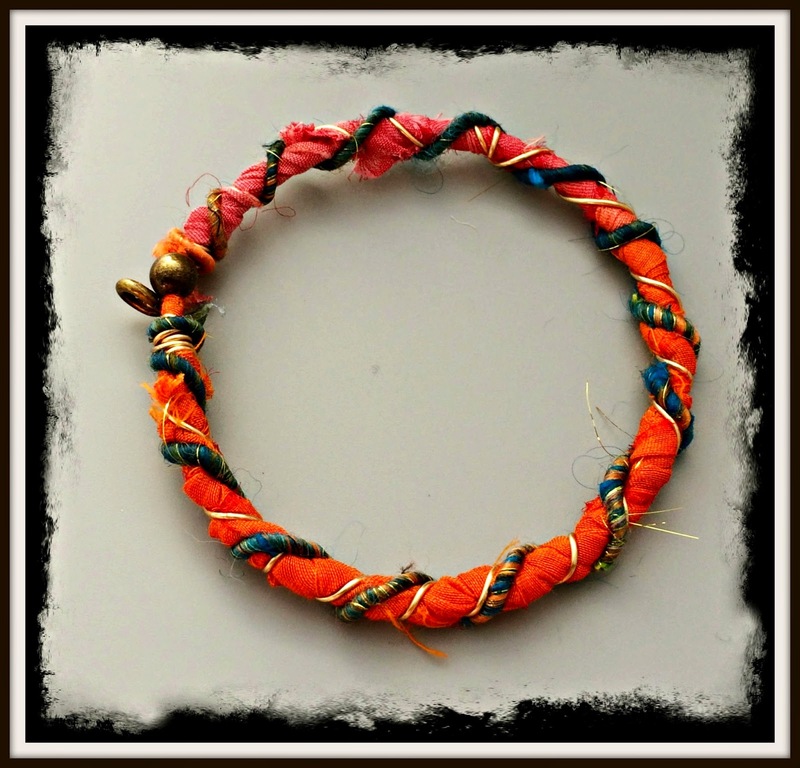 I took the sari silk from Claire Braunbarth of Smitten Beads and wrapped it around the bangle. I then secured it with brass wire along with WooleyWire for some added color. This is totally outside of my usual style and I am rather pleased with it. 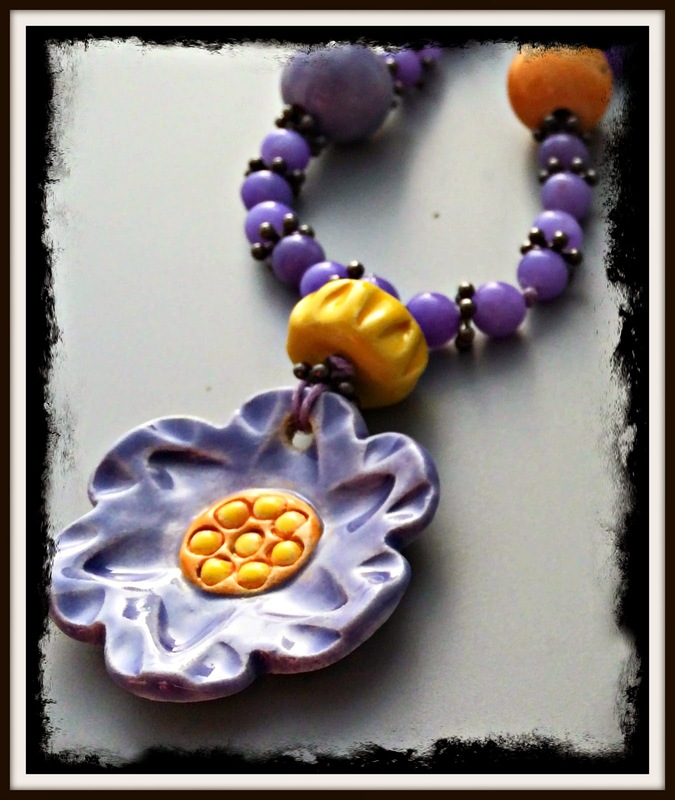 I had so much fun with these ceramic beads from Leslie Watt of Thea Elements. I have long admired her jewelry and now I am addicted to her beads. The colors just screamed spring and encouraged me to work with a color that I usually avoid. Yeah I brought out some creamy yellow jade beads that I had picked up in the past and never used. 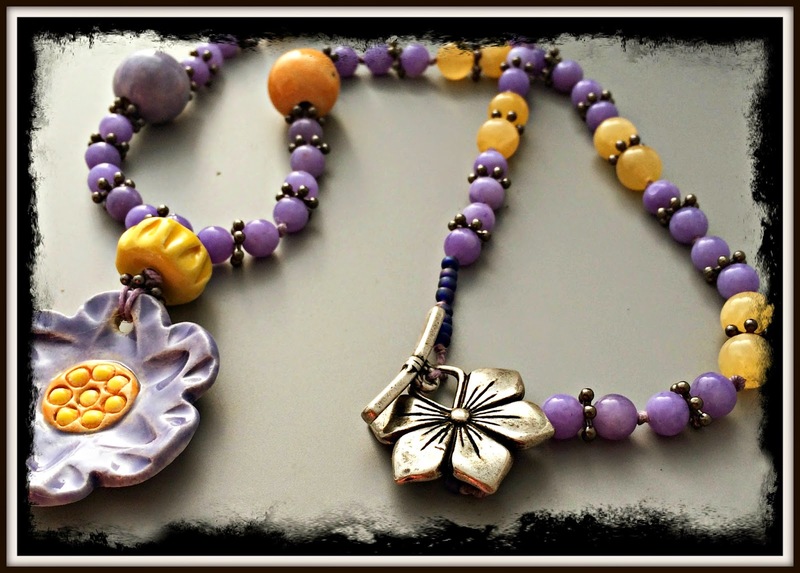 I also used some chalcedony that just patched the bluish purple in the flower and a pewter flower clasp that I had been hoarding. Fate (with a little help from Chloe's playfulness) finally stepped in and a strand of purple shell beads ended up near the birds. Finally bells went off and this necklace was born. I still want to fiddle with it a bit more because I want the little purple bird to have more of the limelight but overall, I am happy with necklace. I never did figure out a way to use the leaf but I am sure that I will. I will be sure to share it when everyone when I do. Now I did say what there was twenty of us participating so be sure to see what everyone else did with their beauties. 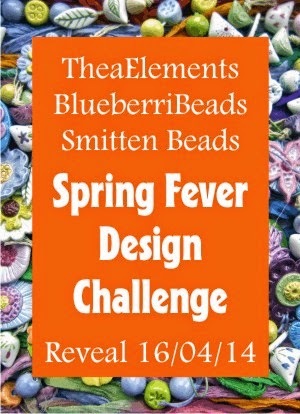 Beautiful designs bursting with spring goodness and great that you conquered your fibre phobIa too! Thank you for joining in with our challenge. Beatiful designs bursting with spring goodness and great that you conquered your fibre phobia. Thanks you for taking part in out challenge. Sheila-I understand your reluctance to use sari ribbon, but you did a great job with that bangle. Purple is a favorite of mine so I envy your purple flower. Your bird looks so sweet on your necklace. That purple necklace is stunning, I love the colours you've picked for the chain, they're perfect! 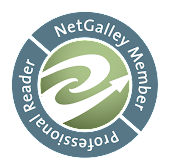 Glad to have you with us for the challenge, thank you! All gorgeous! I like your wrapped bangle! Both very nice, but I really like the first necklace. I like how you've used the ceramic bead into a bail - it works really well. Love your pieces!! I used wooley wire on one of mine too! :) I was glad I had some of the same colors to use! Beautiful job!! PURPLE! And those clasps are perfect! Oh that last plummy necklace is delicious! Such gorgeous color! All your pieces are great, but the best is the bangle!! It turned out beautifully. Obviously no need for you to be intimidated by sari silk any more! Oh, Shai! The purple necklace is exquisite. The birds are so pretty! I am in love with Caroline's birds. Love love them. You created a stunning flower of a beauty with your purple and yellow necklace too. It is all blooming, soft & fresh yet strong! You have a wonderful style with an energy that moves right to me. And the bangle! I am so excited to see your design as my sari brainstorming was a bit well, sorry. Brilliant to wrap with the woolywire! Looks great! xxoo Rita p.s. This was fun! Oh how beautiful are these!?!! I do love the first one, but the second one is something that is striking, yet subtle at the same time, making it my favorite! Perfect, perfect, perfect, I too love the purple and yellow necklace, youve got the mix of colour so right there! Just love your designs! Purple oh Purple! I am really drawn to your purple wire wrapped necklace...just so pretty! Kudos to you for conquering silk. All three of your designs are beautiful.